Last month we talked about renting versus buying. Because this is such an important topic, I want to bring it up again, but from a different angle. We are currently in a Landlord’s Market. Following a rash of short sales and foreclosures following the market crash of 2007, many people who had previously owned homes became renters. Their mortgage payments had become unmanageable, and they were in their homes “upside down,” and lost them for these reasons. This influx of renters, on top of the existing market of renters, grew. Add post-college and young adult renters to the mix, and the rental market was flooded, driving up rental prices. 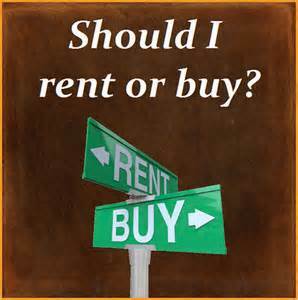 So is it better to rent or buy? The answer depends on a lot of factors, as explained in this New York Times article. Some of those factors include the price of a home, amount of down payment, how long you plan to live in that home, mortgage details (e.g., interest rate, inflation, etc. ), closing costs, maintenance and fees, and renter’s costs. Because you aren’t comparing apples to oranges, making the decision to rent or buy can be a difficult one. Discussing your options with an experienced real estate agent can help. Even if you aren’t ready to buy today, having that first conversation is a great place to start!